A Lead Based Paint Scare!! I was thumbing through my pictures the other day I and I realized I never shared this chest with you! This is one of my favorite pieces, down the road I will probably regret selling it, but I didn't have anywhere for it to go. 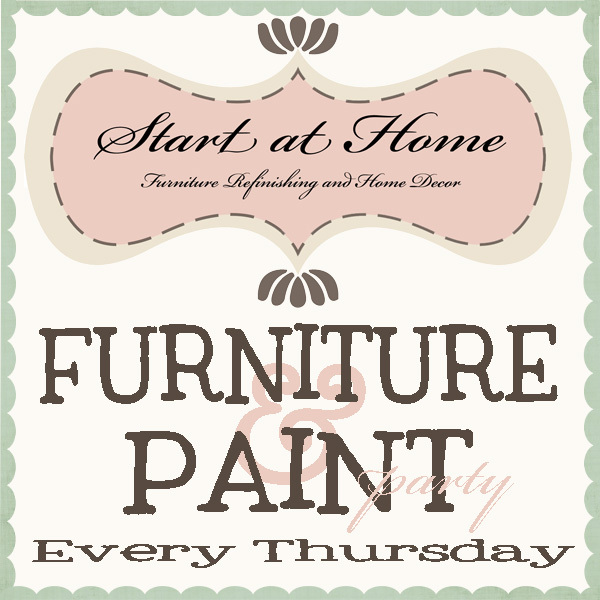 We had the biggest Furniture and Paint Party YET!! HOORAY!! Thank you to all of you for linking up each week. I love looking through everyones projects, I can't believe how much talent and creativity there is out there! Thank heavens for the blogging world so we can all share our fun creations. 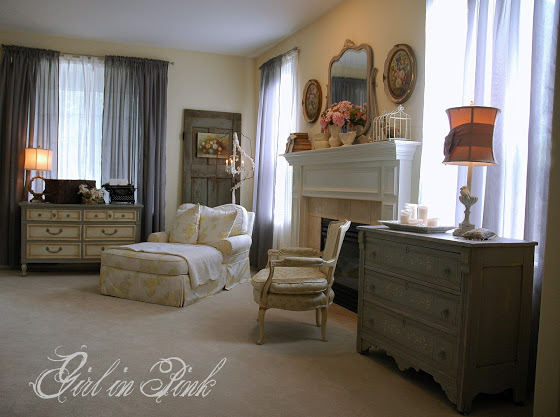 Look at this room by Girl in Pink, Did you see the old door, the fun mirror, the cute lamp, and all the beautiful furniture? 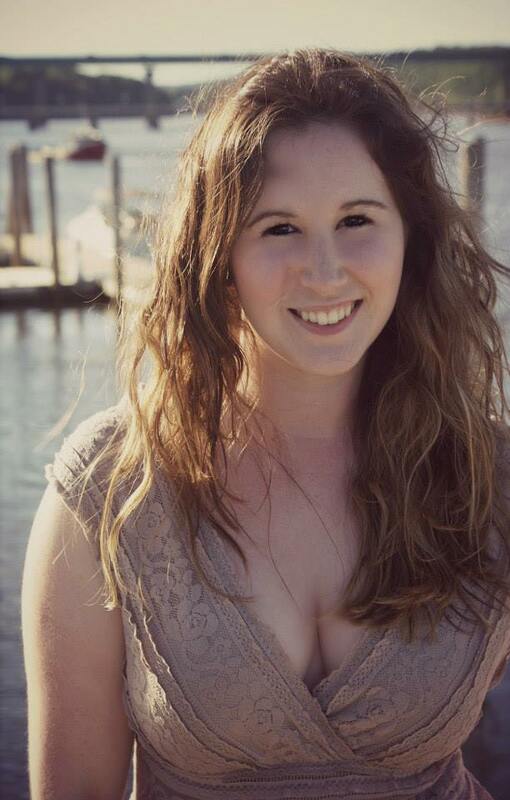 WOW, what is there not to love? This room is STUNNING!! And look at this bed by For the Love of White. 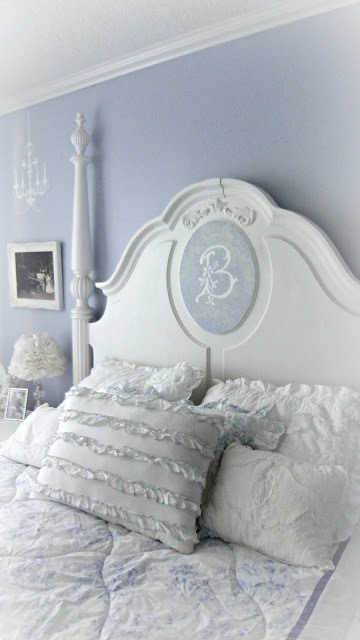 I love the added Monogram to the bed, and how clean and fresh everything is! 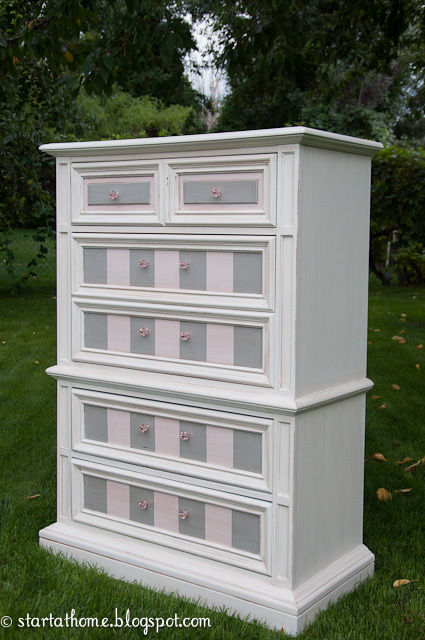 I love this Hand Painted Chest by Full Circle Creations It is so beautiful! 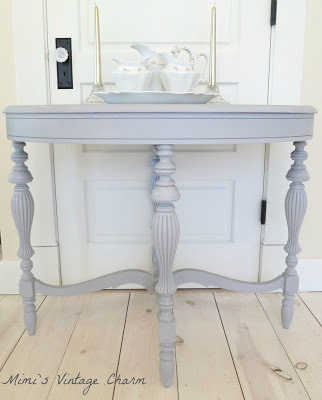 And Last but not least this Beautiful Calming table by Mimi's Vintage Charm, I love those legs! 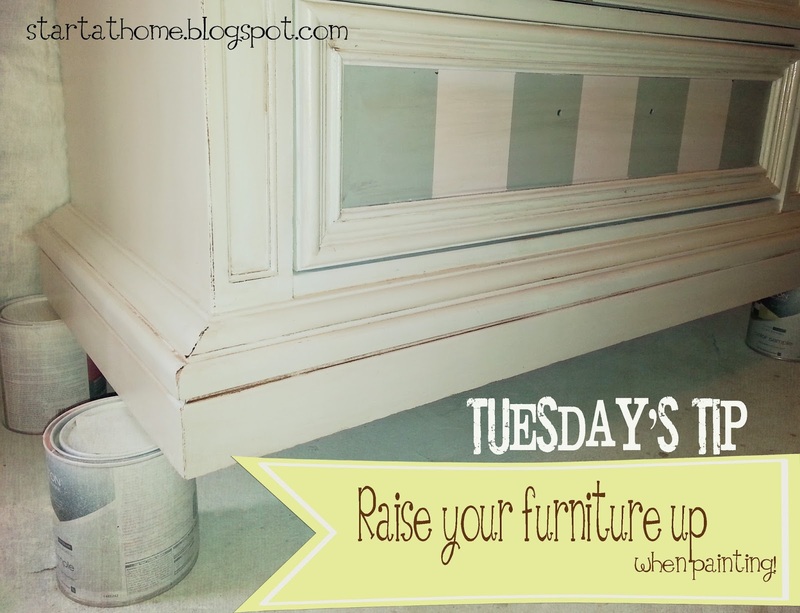 Tuesday's Tip: Raise Your Furniture Up! Today's tip is rather short and sweet, but has saved me tons of time. Of course, I had to learn this tip the hard way! When painting raise your Furniture up on paint cans! When Paint the bottom edges your brush will not get all dirty from touching the floor and it makes for a crisp finish on the bottom edges. If you are like me and spray most of your furniture this will help so the air doesn't spit up any dust/dirt on the floor and makes for a nice smooth finish! I told you it was short and sweet, but makes life much easier! My neighbor/friend contacted me asking if I could find and refinish a dresser for her daughter, "OF COURSE I CAN!!" 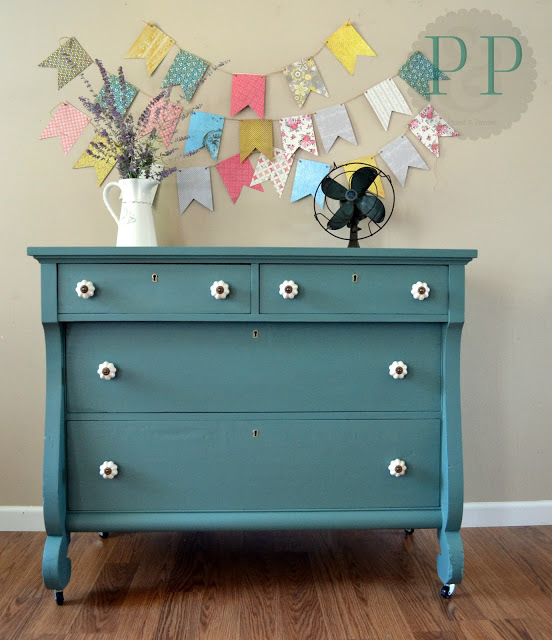 I found this fun dresser, no it didn't look like this when I found it, it was all wood and needed some work. Once I got it home I had my friend come look at it, I probably overwhelmed her with ideas, my brain was going crazy with all the things we would do, ombre, stripes, 2 tones.....etc etc etc! She said she would think about it, and I thought, "dang it, she is going to want it all white." 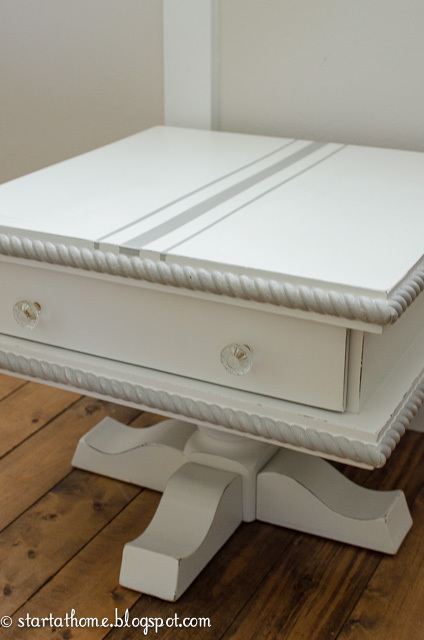 Not that all white is a bad thing, and this dresser has enough details all white would look just fine. 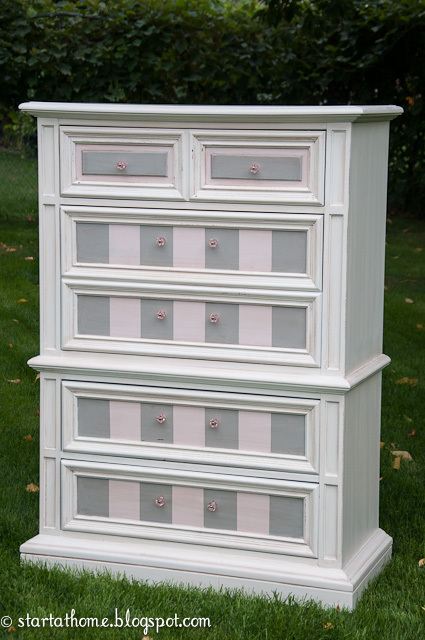 You can imagine how excited I was when she text me asking for the Dresser to be all white with Pink and Gray stripes! Yes I know all white is easier but not nearly as fun! 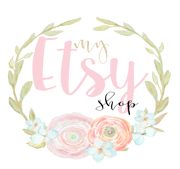 I was searching my blog last night for a room and I realized how hard it was to find different rooms in our home, and I even live here! So I have created a tap at the top of the page, Our Home Tour, that will always be there! I am glad I went through everything it is always so fun to see how everything changes, I need to take new pictures of some of the rooms! Let the tour begin! Welcome to our Home. Sit back, relax and Enjoy your stay! My entry way is one of my most favorite parts of my home. 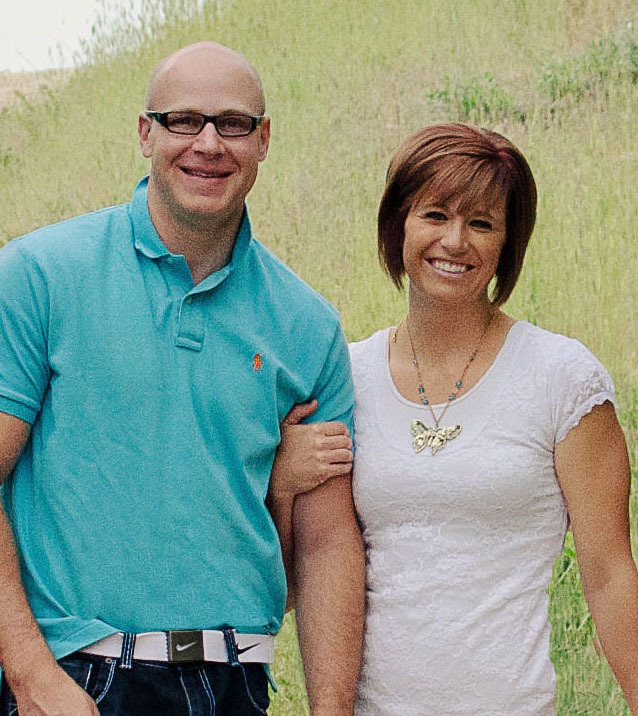 It tells our families story and invites all in! It is PARTY TIME! As always I am amazed at all the fun projects everyone linked up last week. I am so excited to see what everyone has been up to this week! 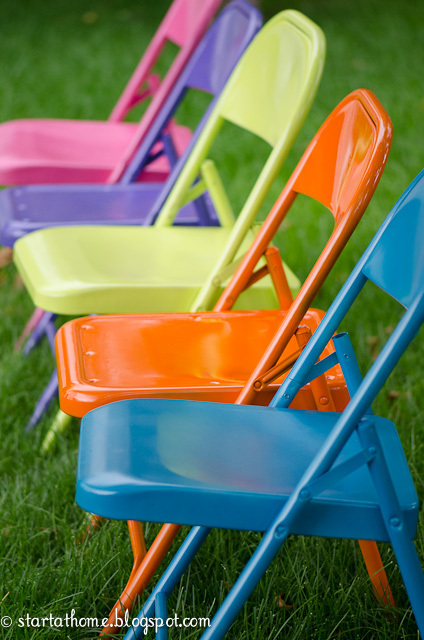 Here is my paint project this week, Spray Painted Folding Chairs! 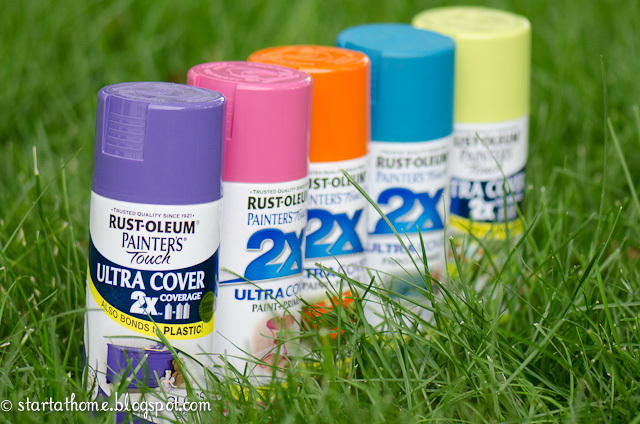 I love the bright colors and it was fun to pull out the spray paint for a change this week! Look at this Reupholstered Chair by Remastered Relics. 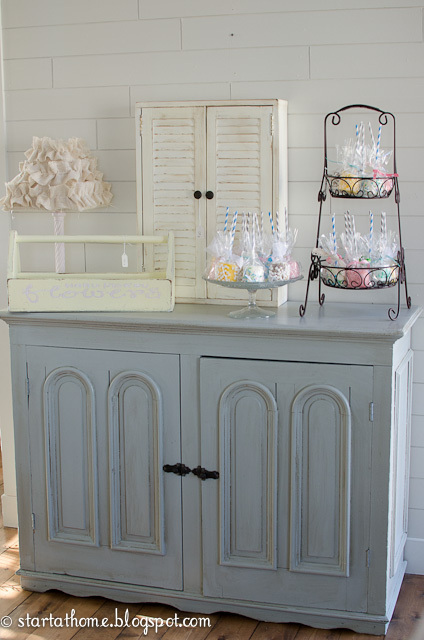 I love the fabric with the Graphite Chalk Paint, what a fun combination! I can't believe Sharon @ Elizabeth & Co found this furniture on the CURB, yes that's right the CURB! What a find, these pieces are Beautiful, of course with a little magic from Sharon! 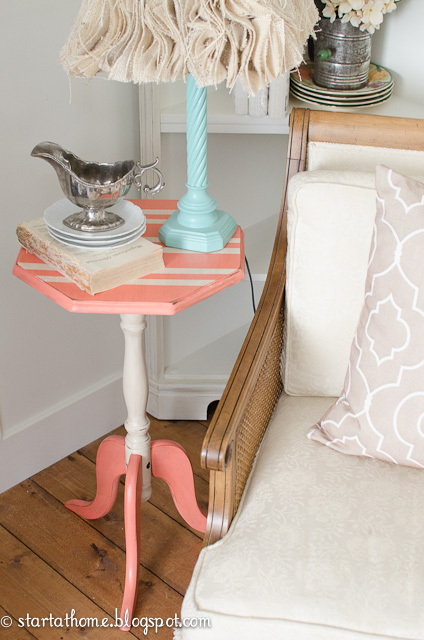 I love this Coffee Table A Little Bit of Paint refinished for her Mom. She even added that bottom shelf, Beautiful! 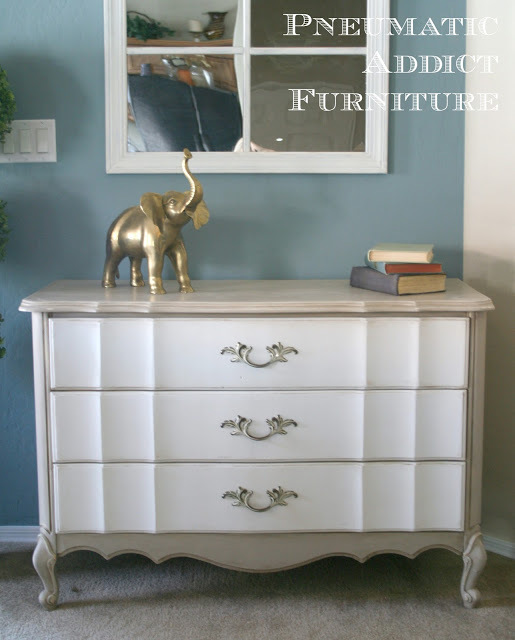 And last but not least this beautiful 2 Toned Dresser by Pneumatic Addict She mixed up her own blend of Ce Ce Caldwells Paint, and I love how it turned out! 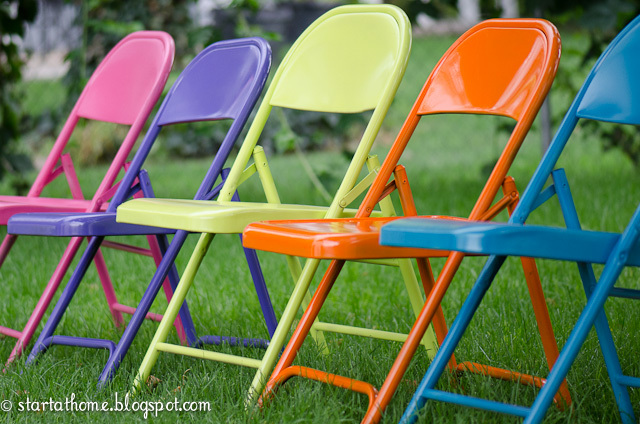 I had 20 rusting, spider infested metal folding chairs sitting in my shed, which I have made my husband move from house to house, after all who doesn't need a folding chair? Even when they were disgusting my neighbors always asked to borrow them. I pulled them out last night to clean up a bit for a party this evening, I was so embarrassed by their current state, I didn't dare lend them without a little repair.......Out came the spray paint! It has been a while since I have spray painted and I will admit it was a happy reunion! 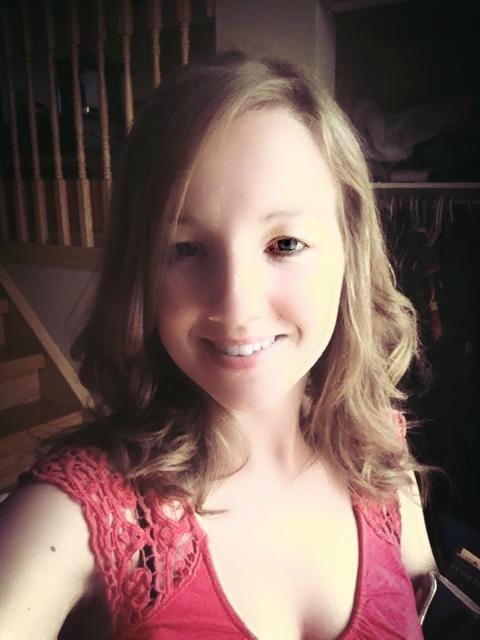 Sometimes it is nice to change things up a bit! I was pleasantly surprised at how well the spray paint stuck straight to the metal. Each chair required 2 coats with the exception of the lime green, since it was a lighter color I did an extra coat on it. 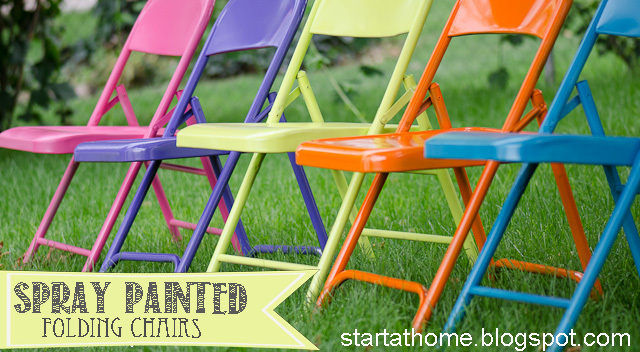 One can of spray paint covered 2 folding chairs. Each can of spray paint was roughly $4 so for about $2 a chair not too bad! They were a hit at the party tonight! Everyone had something fun to say about them. My husband has named them my "easter egg" chairs. I think it fits quite nicely! Have you ever looked at a project and wondered "do I need primer?" I have done this so many times, and even though in most cases you can't go wrong with applying primer you may be adding extra work. 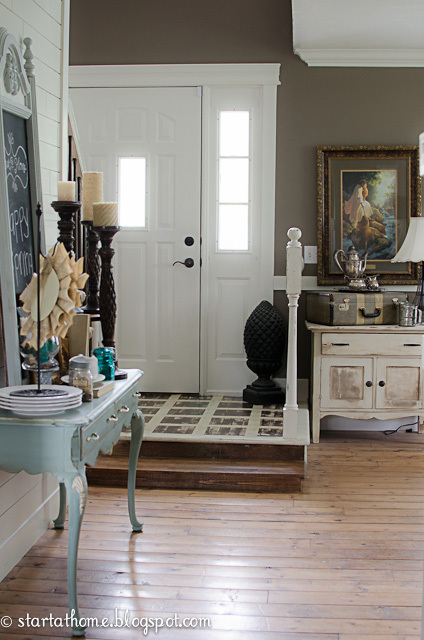 1- Primer will help seal raw wood requiring less paint. 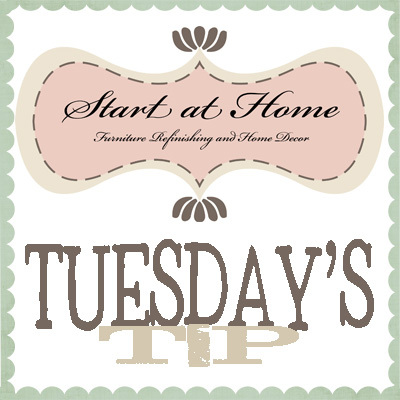 2-Primer can seal in any old stains/odors on walls, furniture, and floors. 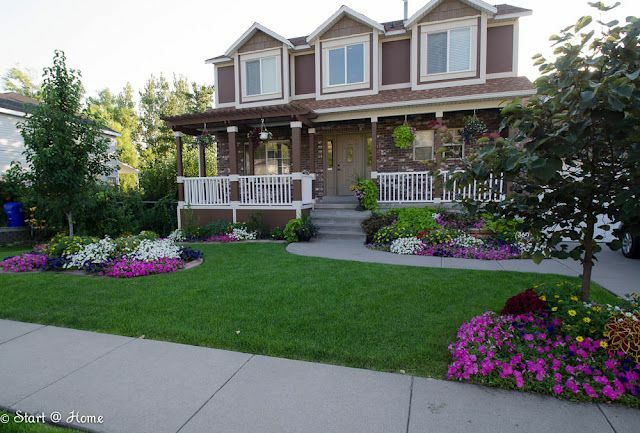 3-Primer can help paint stick to a surface like metal, plastic, and previously glossy finishes. 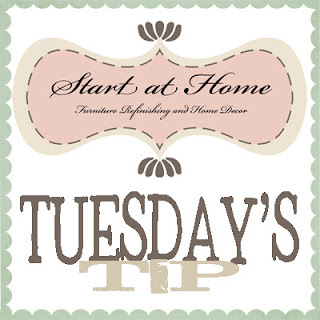 1-If you have a wall or piece that has been previously painted and you are wanting a new color, color covers color better! There is no need to prime as paint sticks to paint. 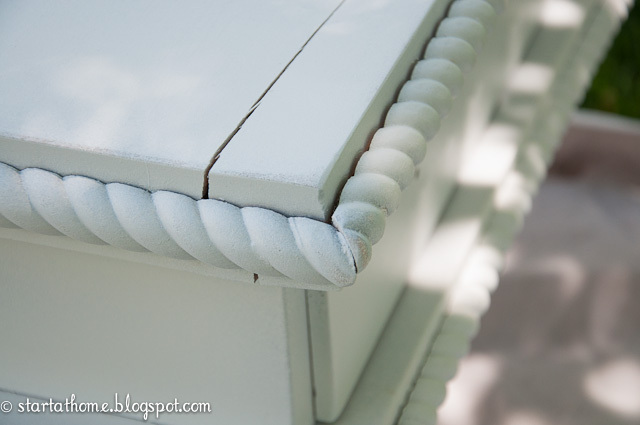 2-if you are wanting a piece of furniture to look "chippy" not priming can help your paint flake naturally. My go to primer is Kilz Latex. 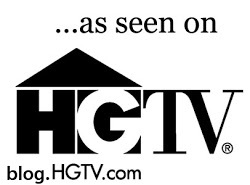 It is very cost effective but seems to do the job as good as other brands I have tried. I also really like their spray primer, I use this for small items that can be a pain to paint, like a brass chandelier, it makes life a little easier! 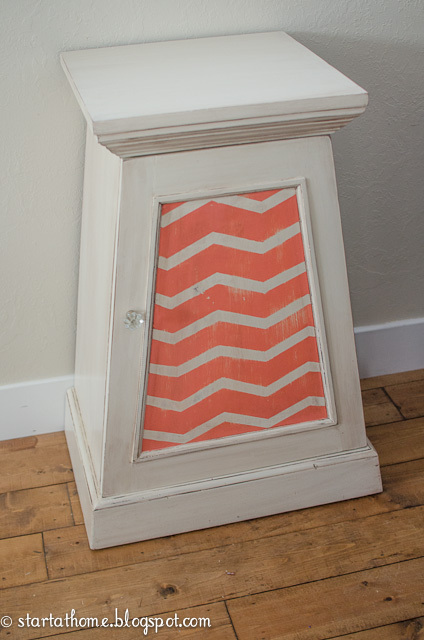 I am loving coral, so you can imagine how excited I was when Amanda asked me to refinish this piece for her. found this little beauty at a garage sale last week. It was rather sad looking in the corner all by itself so I took it home for a facelift! I love to find little pieces I can have some fun with and make an accent piece out of! 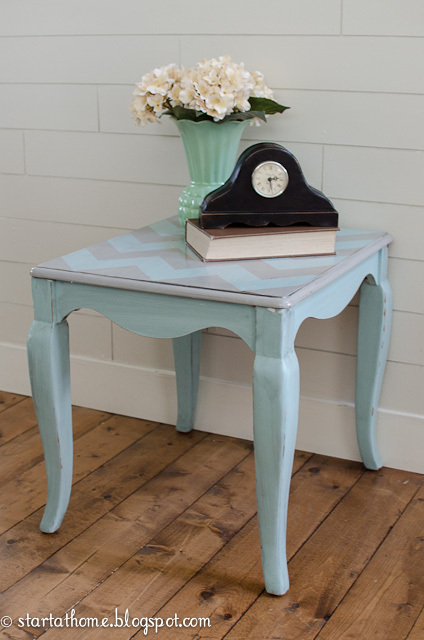 Since coral seems to be the color of the week around here, I couldn't resist painting this table coral too! Isn't it so fun and with the turquoise lamp, AHHH!! 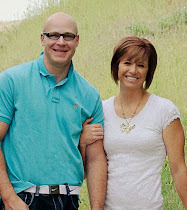 I am so excited to be joining forces with Living Better Together and I want Crazy! 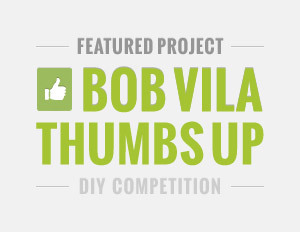 Come Link up any of your fun projects! 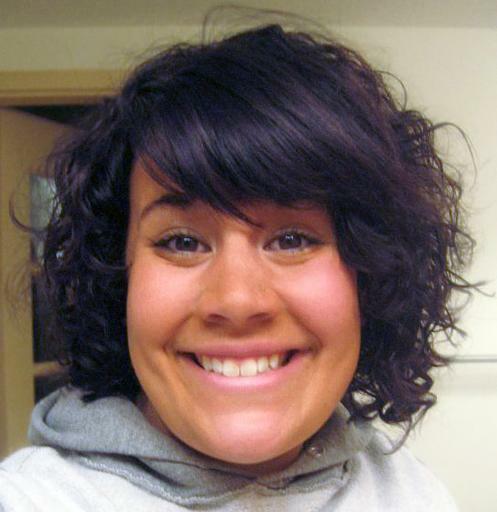 Brooke from Start at Home. If you are interested in co-hosting, email Rebecca at fickrj5@gmail.com. Share this party with your friends, and don't forget to make some new ones while you're here! We all love making new friends, don't we? 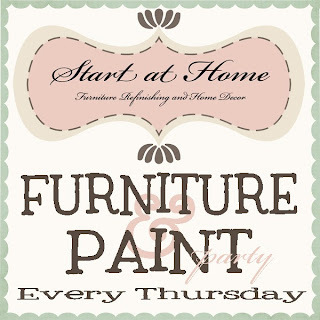 I decided to expand the paint party a bit to a FURNITURE and PAINT Party!! I have seen so many fun pieces out there that don't always entail paint, like upholstery, and I wanted them to be added too. Have you even had an old piece of furniture where over time the wood began to separate? This piece was no exception to that, good news is there is a SOLUTION! 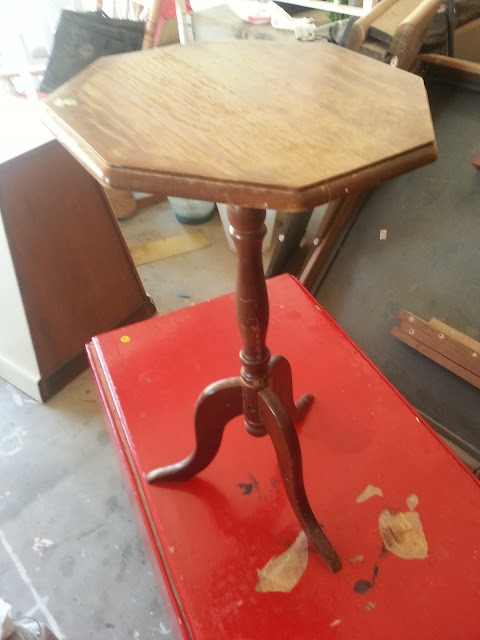 I bought these little end tables in March for my boutique I loved the french legs and the tops were still in great condition so I only Painted the legs, obviously they didn't sell so I listed them in the local classifieds and NOTHING nothing NOTHING. I decided to get a bit more creative with them, and a little adventurous! It is that TIME AGAIN!!! I am so excited to see what everyone has been up to! Here is my fun Paint Project and I even get to keep it! I love the 2 tones and the grain sack lines! 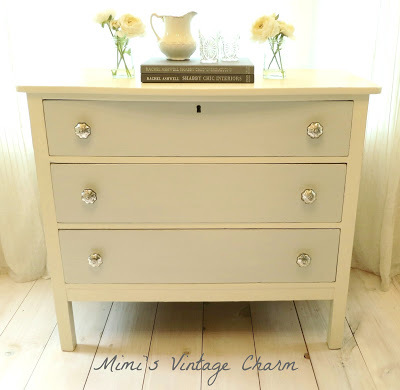 What a fun 2 toned dresser by Mimi's Vintage Charm done with Chalk Paint! Beautiful!! 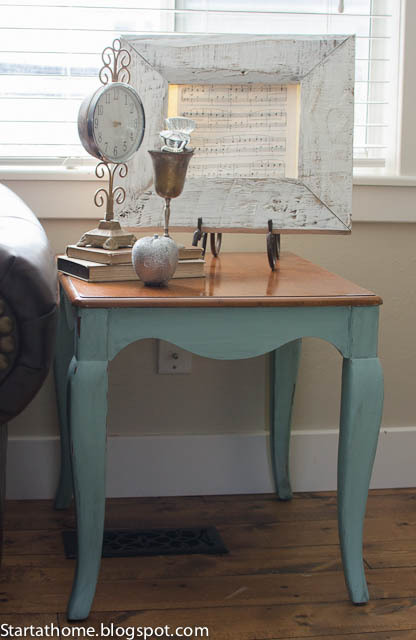 I love how Helen at Picked and Painted always mixes her own colors, and they turn out amazing!! I want to paint something this color!! 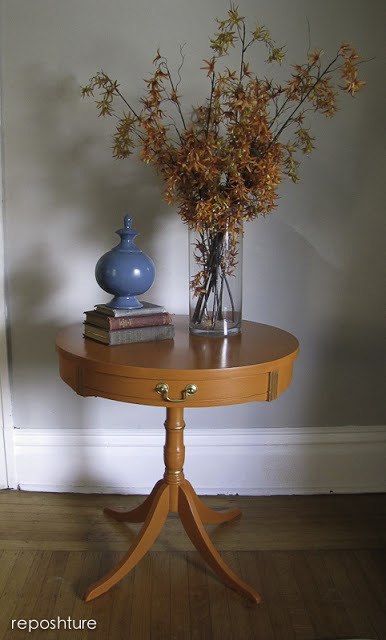 I love the bold color of this orange table, and the blue accessory done by Reposhture Studio!